It is one of the most popular wildlife parks in the state, drawing hundreds of visitors to it every day. And why wouldn’t it? Located in the quiet corner of Ahmedabad, very close to the Kankaria Lake, the zoological park is one of a kind housing rare animals and endangered species. Most of the people come here to get a glimpse of its various animals, birds and reptiles including Asiatic lion, flamingo, chinkara and such. The highlights though remains the only- Albinos! which you will get to see a plenty here! Rich in wildlife and perfectly backed by the beautiful vistas of Kankaria lake, Kamala Nehru Zoo makes an ideal destination for picnicking and relaxing. You can come here with family and friends, walk around and spend some blissfully calm moments amidst the lap of nature. No Smoking Zone in Zoo Area. Do not Carry Plastic Bags along with. How popular is Kamala Nehru Zoo? People normally also visit Bhadra Fort And Teen Darwaja while planning their trip to Kamala Nehru Zoo. Very well maintained. All the animals, birds, snakes are kept in cage with proper living environment. There are other wild animals like tiger, leopard, elephant, deer, beer, etc. Kept in proper manner with caging. There are two zoo's one is old one and second is new one which is located beside old one. Ticket bought at any of these zoo's is valid for other as well. The new zoo has is smaller compared to old but formar will give good views. It is completely darkened in order to give the best experience to visitors. Most of the animals in old zoo are sleeping. The ticket price is 50 rs for adults and 20 rs for kids. Looks to be very well managed. All the animals looked nice and and healthy. Only didn't understand why the elephant was tied. Would have been nice to see her roam about. This is so famous place at Ahmedabad in Gujarat. This is a big zoo and beautiful garden. Also. Here is a pond in this place. Thousands of people visit here everyday. There are many shops in this zoo to serve food for visitors. I love the place so much. 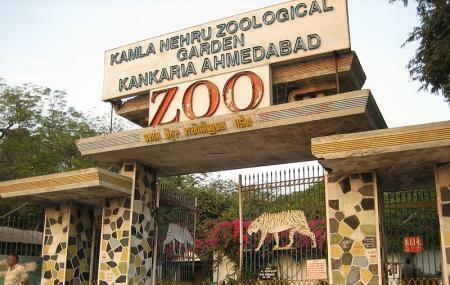 Great Zoo which located into the premises of Kankaria Lake. This includes hundreds of animals such as Tigers, Panthers, Lions, Hippo. Apart from it Crocodile, snakes, turtles, various birds. It would be fun to bring children over here for getting more knowledge in animal life. Recommended to all wildlife lover. The zoo is located inside the lake area. Most of the animals were sleeping or laying down. Some of the monkeys can be seen easily in the roadsides while we travelling. The migration bird should have been kept in a bigger cage or closings. The smells are bad near some of the animal cages.